[Latin] Probate at London 2 Oct 1731 on the oath of William Norman, executor. 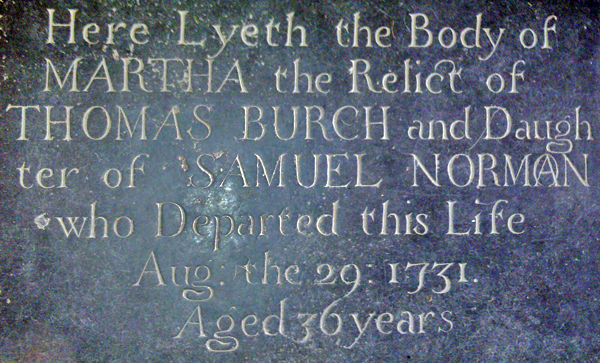 Martha, relict of Thomas Burch, daughter of Samuel Norman, died 29 Aug 1731 aged 36 according to her memorial at Keach's Chapel (photo above). See Gyles Family page. She was a member of Winslow's two leading Baptist families: her mother Martha was the daughter of William and Mary Gyles. She married Thomas Burch the younger of Hemel Hempstead at East Claydon on 4 July 1719. His brother Robert was apprenticed to her father Samuel Norman in 1720. Thomas Burch was also a Baptist, and a draper. In his will, proved on 19 Nov 1730 (National Archives, PROB 11/640/391) he left money to poor widows "only that are dissenters" in Hemel Hempstead and Leighton Buzzard, and to the dissenting minister in Hemel. He left Martha the interest on £1,600 if she remained a widow or on £800 if she remarried, "in lieu and Bar of a Bond of four hundred pounds which I gave upon my marriage". He also left her all his "household Goods Furniture and Implements of household whatsoever Plate Rings and Jewells" if she had a child by him, but otherwise she should give them "to such of my Relations as she likes". Martha apparently interpreted this to include her own relatives, and she seems to have insisted on her marriage settlement rather than her husband's alternative arrangements. Her interest in clothes and her plans for an ostentatious funeral are very surprising in a Baptist of the period. Coffee: Coffee-houses became popular in the second half of the 17th century, but this is the first reference to anyone in Winslow drinking it. Camblett = Camlett, fine cloth that could be made from wool, silk or angora, or combinations thereof. Dimothy = Dimity, a stout cotton fabric woven with raised stripes or other figures. Linnen: Burial in linen would involve an extra charge as the Burials in Woollen Act still applied.